The Derivative Filter operation removes points from a horizon with a strong change in the gradient. 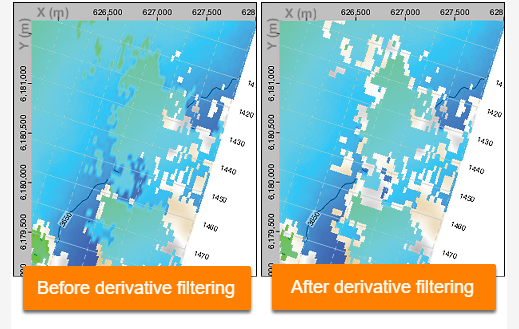 Use the derivative filter to identify and remove low quality picks, especially in areas where automatic propagation may have tracked a different event (e.g. in areas with faulting and other geophysical anomalies). 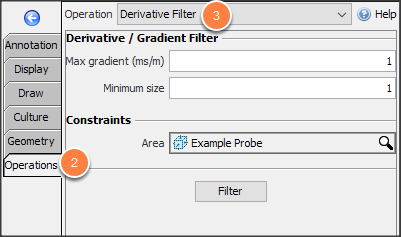 Where is the derivative filter operation? 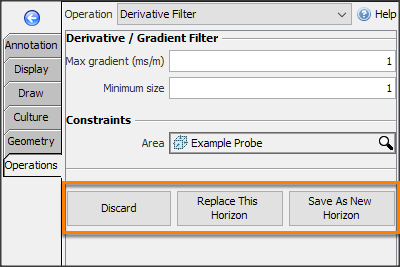 Note: The Filter button is disabled if the horizon is waiting for another operation (such as propagation). Insight notifies you to complete the previous operation before continuing. Derivative filter is found in the Map View, under the Operations tab (along with other horizon operations). 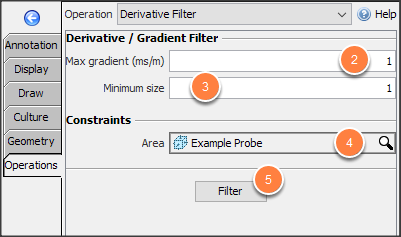 At Operation, select Derivative Filter. In the navigation bar, select the horizon for the filter. At Max gradient (ms/m), enter the maximum gradient to allow. Points on the horizon that exceed this value will be removed. At Minimum size, enter the minimum number of connected points to remove. A minimum size of 1 removes single points anywhere on the horizon. A minimum size of 5 only removes patches of five or more points. Note: By default, the new horizon will be named: "horizon_name (filter gradient value)". For example, the operation above will yield a new horizon called "Sample (filter >1 ms/m)". To rename the horizon, see Horizon Details and Configuration.